Americano? Cappuccino? Irish Coffee? Which is least likely to blow up my heart? Coffee is my lifeblood, and I regularly consume it in every shape and form: Americano, macchiato, cappuccino, frappuccino—you name it, I drink it. But lately, I’ve been on yet another health kick, which means I’ve been forced to reassess my relationship with the holy brown beans that keep me going in this godforsaken world. Because I can’t possibly ditch coffee altogether—my heart might actually stop beating if I were to do that—I asked Dana Hunnes, senior dietitian at the Ronald Reagan UCLA Medical Center, to help me rank every coffee drink by how healthy they are. In other words, the more milk and sugar a coffee drink contains, the less healthy it is. That’s because milk (especially milk from a cow) contains casein, which may promote the development of certain cancers, and sugar is associated with an array of ailments, including heart disease, depression and weight gain. While high doses of caffeine also can have negative effects—including addiction, insomnia and irritability—moderate doses of caffeine (like those Hunnes mentioned above) can actually help you lose weight. It does this by stimulating a process called thermogenesis, which converts calories into heat energy (and explains why you might start sweating after having a few too many shots of espresso). A 2005 study even found that obese caffeine-drinking dieters saw greater improvements in fat mass, body weight and waist circumference than their less caffeinated counterparts. All of which means, as long you don’t drink too much coffee, caffeine isn’t the enemy here. With that, let me go get another coffee and start this list. Hunnes also explains that straight-up espresso and an americano, which is simply espresso diluted with hot water, are “quite similar to black coffee.” For our purposes, the only real differences between coffee and espresso is that the latter is ground much more finely and packs, on average, less of a caffeinated punch. But that’s only because people tend to drink more regular coffee than espresso. While an ounce of espresso contains approximately 65 milligrams of caffeine, and an ounce of coffee contains about 15 milligrams, nobody drinks just one ounce of coffee (but many people drink just one ounce of espresso). For instance, a single shot of espresso from Starbucks contains 75 milligrams of caffeine, whereas an 8-ounce cup (which is their small size) of their Blonde Roast contains 180 milligrams. All of which means you’re more likely to consume higher amounts of caffeine while drinking plain old coffee than while sipping on a latte. 4. Macchiato: A macchiato is espresso served with a dash of foamed milk on top. “Because of the low volume of milk used, it’s not much less healthy than espresso, but that also depends on the type of milk used,” Hunnes says. Whole milk, for instance, is considerably less healthy than soy milk. 5. 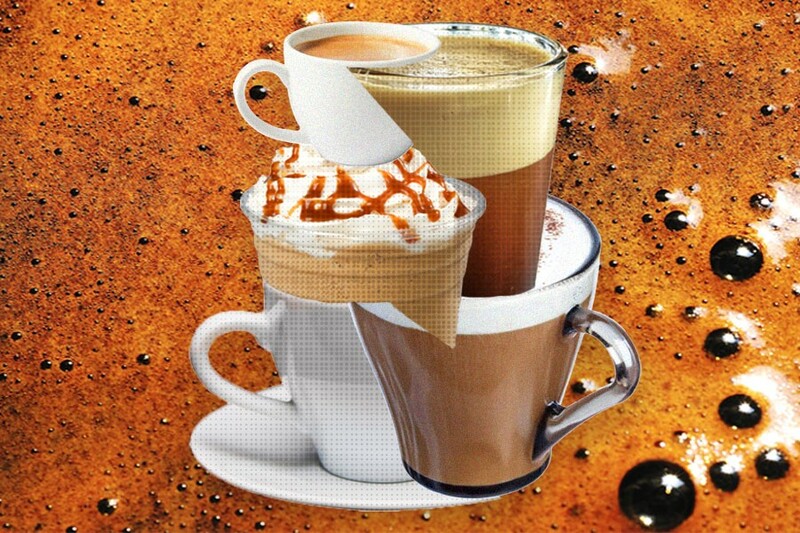 Cappuccino: A cappuccino consists of one-third espresso, one-third milk and one-third frothed milk. That extra milk, of course, puts the cappuccino below the macchiato on our list. But again, Hunnes emphasizes that certain milks—she continues to push soy milk—have fewer calories, less saturated fat and zero carcinogenic caseins when compared to milk from a cow. “For anyone afraid of the plant-based estrogens [in soy milk], there are far more animal-based estrogens in cow milk that have more of an effect on the human body,” she explains, meaning swapping the cow milk in your cappuccino for soy milk certainly won’t make you grow breasts (if that was your concern). 6. Irish Coffee: Irish coffee is a cocktail consisting of hot coffee, brown sugar and Irish whiskey, usually also topped with heavy whipping cream. “I don’t normally recommend combining alcohol with coffee, but small amounts of alcohol might be healthy [although that’s up for debate], as is coffee and the low milk content in this drink,” Hunnes says. 7. Flat White: A flat white usually contains more milk than a cappuccino and less milk than a latte, which is is why it ranks seventh on our list. 8. Latte: “This is primarily a milk-based beverage mixed with espresso,” Hunnes explains, which means it contains more milk than any of the drinks listed above. Flavored lattes, which are especially popular this time of year, also contain tons of sugar, which we already know won’t do your body any good. 9. Mochachino: More commonly known as a mocha, a mochachino is basically a chocolate-flavored latte. “It’s like chocolate milk coffee,” Hunnes says, which means it contains a lot of milk and a lot of sugar. 10. Frappuccino: Frappuccino is actually a trademarked brand of the Starbucks Corporation, and it’s basically a line of ice-blended coffee drinks that are typically packed with sugar, then topped with even more sugar in the form of whipped cream. Due to their extremely high sugar content, these are insanely unhealthy.